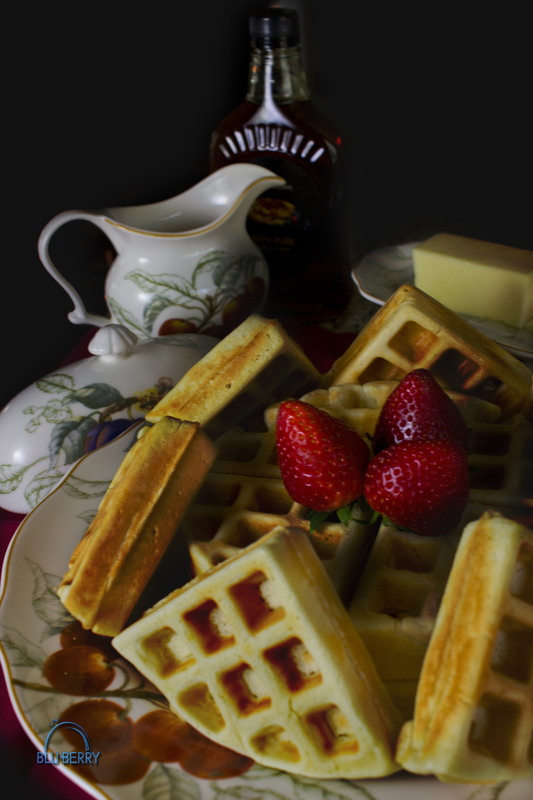 Bluberry Food Shoot, How about Waffles? 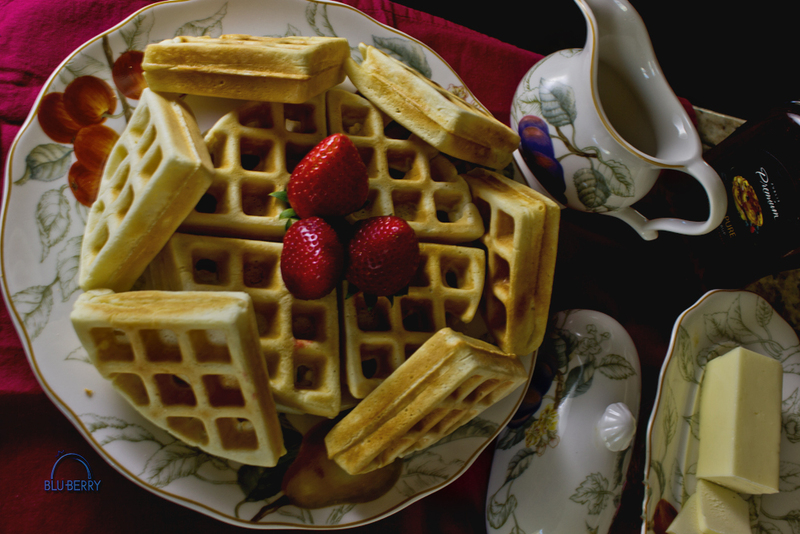 Texture of the waffle offers visual cues to the way it might feel when you enjoy a bite of one. With a camera in hand and an idea, something happened. No, not something overly exciting, but something that happens all across the globe most mornings. Breakfast. Something we know we should include at the beginning of our day but in this instance we would not be able to go without it. In our ongoing series “Bluberry Food Shoot” we thought waffles would be a good subject for the simple reasons… that they are common and interesting. Starchy cakes with a unique shape and all those little compartments to display and shape the light which strikes them. Oh, and another reason-we had some sourdough starter which needed to be used up. Before we began we set up one 18-inch soft box/diffused LED light and put it camera left of the scene just above the scene table. This was in an effort to mimic the light of day streaming through a window. In post we adjusted levels and color just a little to darken the background in those few shots it was distracting. All in all the shots were pleasing. 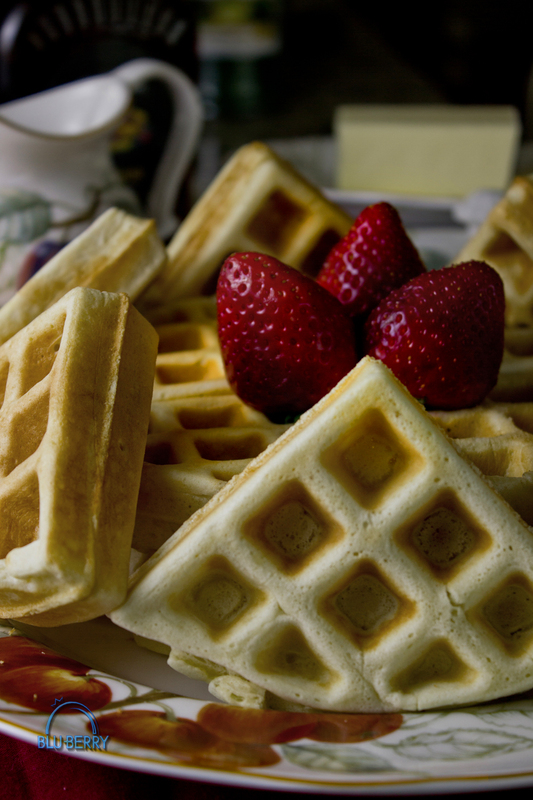 One caveat though we offer to you is that if you plan on using waffles for a shoot them plan on eating them immediately after…it would be a good idea to wrap them in a damp paper towel and reheat them using your microwave oven. We didn’t do that and they were pretty cold and tough.